With January already behind us, what better way to look forward to the rest of the year ahead than by taking a step back? 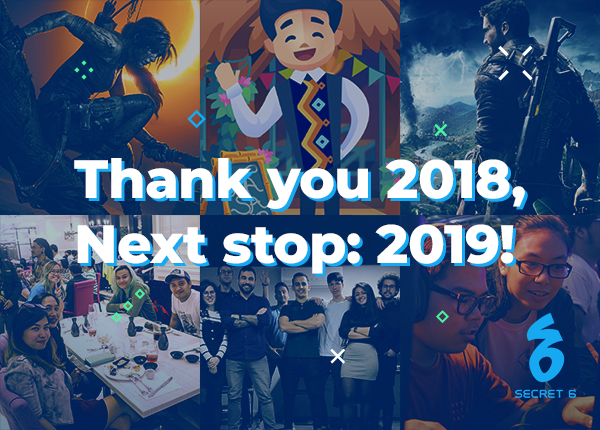 Last year proved to be eventful: we rose to the challenges that new projects presented, and we were able to benefit from opportunities that came our way. Some of those opportunities included partnerships that contributed to our growth as a company. The many resulting insights and learnings allowed us to finish 2018 strong, and as we continue to welcome 2019, we’re looking back at some of the highlights of last year below. 2018 marks our 13th year in the business, which saw the best for Secret 6 in terms of revenue and growth. Aside from further developing our company’s skills and competencies, we underwent internal expansion with bigger office spaces and new departments. Our Quality Assurance company Aphondo experienced its own steady growth by adding clients, and Secret 6, in a major step forward, established a new studio in Madrid. While the Manila studio works on 3D art for AAA titles, 2D art, and full game production across all gaming platforms, this new Madrid studio is currently focused on 3D art services for video games with plans to expand over time. This allows us to tap into talent from Europe, and better support the company’s European clients. Last year also marked the start of our rebranding efforts across our social media channels. Our biggest change was a brand new look for our website, presenting a vibrant feel and new content for you to peruse. Last October we announced our part in Lara Croft’s new adventure through the very much awaited Shadow of the Tomb Raider, where we worked with Eidos-Montreal as a development partner. We provided a wide variety of complex assets in what proved to be one of our biggest challenges so far. Some of these assets are already available on the website for viewing with more on the way, so stay tuned! Also just released on the website are some of the assets for the crazy fun open world game of Just Cause 4, where our 3D team did a significant amount of work on the game’s unique and core weaponry. Lastly, we were grateful to get a mention in the credits of Spiderman for the PS4. It was an opportunity for us to partner with non-profit organization World Wide Fund for Nature (WWF Philippines) and aid in promoting their advocacy of sustainable dining, one that we were thankful to be part of. This was achieved through Balay Kawayan, a game we helped design and develop in collaboration with the WWF team. Launched in the International Food Exhibition (IFEX Philippines), Balay Kawayan offered an interactive dining experience where visitors who played learned about how their dining choices affect the environment. Working with WWF gave us the chance to support creating a positive environmental impact through educating players, and we look forward to collaborating with more partners for new learnings and experiences. Of course, it is thanks to the community’s support that we have managed to accomplish so much in the gaming industry so far, both locally and on an international scale. Pinoy Gaming Festival (PGF)We are especially grateful for your participation and reception in the very successful, Esports and Gaming Summit (ESGS), and Plus Attack 2018, the first first-person shooter event in Manila. In addition, we joined ConQuest 2018 in Iloilo, where we were very warmly welcomed. It was humbling to witness the love and continued support for Project Xandata at all these events. In San Francisco, we were immensely honored to be presented with the Best Desktop/Downloadable Award by Game Connection America at the Development Awards. Through your active support, we were also able to take home the People’s Choice Award. All this fuels our desire to get Project Xandata out and into your hands very soon, and we are actively working to provide updates as we accomplish this. To bid farewell and kick off this new year, we had our All-Hands Gathering: a night of good food, great company, and exciting prizes. More things to look forward to are also coming up as we work on highly anticipated games set for launch in 2019 and 2020, and even more content that we’ll be releasing right here on our website. Stay with us for the ride, and make sure to follow us on Facebook and Twitter to keep up with our latest news and updates!